SPARTANBURG, S.C. (courtesy converse.edu) – On April 21, 2017, Converse College celebrated the investiture of its tenth president, Krista L. Newkirk, JD, on campus in Twichell Auditorium. The 90-minute inauguration ceremony featured a processional including the four living past presidents of Converse College and delegates from 54 colleges and universities across the country; an address by President Newkirk; and formal greetings from regional, state, and local leaders who included Dr. Philip L. Dubois, chancellor of the University of North Carolina at Charlotte; Jean Toal, chief justice (ret.) of the Supreme Court of the State of South Carolina; Trey Gowdy, U.S. representative for S.C.’s fourth congressional district, and Laura Stille, mayor pro tem of the city of Spartanburg, S.C.
President Newkirk brings to Converse deep-rooted commitments to academic excellence, diversity and inclusion, collaboration across institutional divisions, and the value of the liberal arts in advancing our global society. “The stories and messages we heard throughout Krista Newkirk’s inauguration are a powerful testament to the continued value of women’s colleges. President Newkirk believes wholeheartedly in Converse College’s mission to develop women who are equipped with the voice, values, and vision to positively impact our world, and she is the right leader at the right time for our college,” stated Kimberly Varnadoe Kent, a 1997 alumna of Converse College who now chairs its Board of Trustees. Kent also served on the 12-person Presidential Search Committee for Converse College. Following the inauguration ceremony, additional celebratory events included a Luncheon on the Lawn honoring president Newkirk and also recognizing Founders Day at Converse – the day in which the college was founded in 1889 by Dexter Edgar Converse. Later in the evening, an Inaugural Ball will be held for the College’s most generous supporters, capped off by a student-organized Band Party on the campus back lawn. 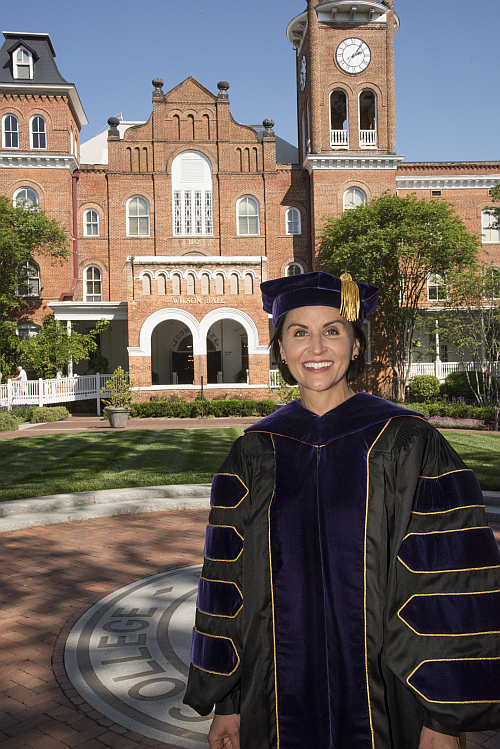 Krista L. Newkirk, a distinguished member of the legal and higher education communities, assumed the presidency of Converse College on July 1, 2016. Prior to joining the Converse community, she served as chief of staff for the University of North Carolina at Charlotte. Newkirk spent her formative years on a cattle ranch in Missouri before attending the University of Missouri’s Honor College on scholarship. After two years, she transferred to the University of Nebraska-Lincoln, where she graduated one year later in 1993 in the top 5 percent of her class with an undergraduate degree in English and a minor in Philosophy. She went on to earn her Juris Doctor degree from the Marshall-Wythe School of Law at the College of William & Mary in 1998. While in law school, she served as editor-in-chief of the William & Mary Journal of Women and the Law, clerked with the Newport News Commonwealth Attorney’s Office, received the Marshall-Wythe Gambrell Professionalism Award, and was selected the Outstanding Woman Law Graduate by the National Association of Women Lawyers. After working for several years as an attorney in both private practice and at a Fortune 300 company, in 2003 Newkirk joined the Office of Legal Affairs at the University of North Carolina at Charlotte. In 2012, she became the university’s first chief of staff. Newkirk was selected by her peers as a Legal Elite in the corporate counsel category by Business North Carolina in 2010. She is a graduate of Leadership North Carolina’s Class XIX and has served on a number of boards, including as Chair of the Education Section of the North Carolina Bar Association and on the Women + Girls Research Alliance. President Newkirk is married to W. Lewis Glenn III, JD, and they have two sons: Holden, a sixth-grader at Spartanburg Day School; and Conrad, a sophomore at Spartanburg High School. Click here to view “Sights & Sounds of Inauguration Day: The Ceremony”. Additional information on the inauguration of Krista Newkirk is available at http://www.converse.edu/inauguration/.